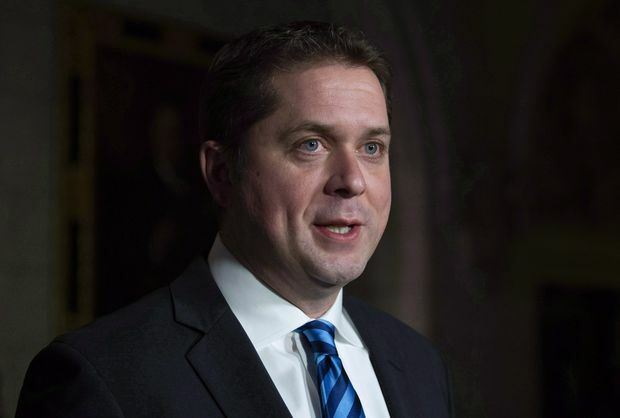 Conservative Leader Andrew Scheer speaks with the media following Question Period in Ottawa, Tuesday Dec. 4, 2018. Such a baroque charge won’t get much traction as a hashtag or an election slogan, so Andrew Scheer must have really meant it when he accused Justin Trudeau of “intergenerational theft” this month. The Tory leader levelled the accusation at the Prime Minister over the federal deficit and debt – the idea being that the next generation will one day have to pay down that red ink, so the government is effectively reaching into our grandkids’ piggy banks. The notion that federal deficits are bad because they impose burdensome costs on future generations – rather than because of contemporary interest payments or a general aversion to big government – is a familiar conservative idea. It’s become a stock line for the leader of the Opposition. And though it has the feel of a talking point now, the thought was fresh and interesting once. It’s based on a perfectly sound principle: that the living owe something to those not yet born. It’s a theme philosophers spend a lot of time discussing and Mr. Scheer is right to smuggle it into the political discourse. The people of the future – the very young and the not-yet-born – are particularly vulnerable because they don’t have a voice in decisions affecting them. And democracies, for all their virtues, are often blighted by short-term thinking that saddles future generations with problems not of their own making, from shaky finances to pinched infrastructure to a polluted planet. But as the list suggests, justice between generations is an idea that only makes sense if it’s applied coherently – including areas of policy that Mr. Scheer is less eager to talk about. Climate change is the clearest case of Conservative rhetoric and action parting ways. There are few issues more important to future generations than limiting greenhouse gas emissions today to ensure a liveable planet tomorrow. Yet the Conservative Party is devoting the bulk of its energy to opposing a carbon tax that most conservative economists believe is the most efficient way to curb emissions. And when it comes to deficits, while the Tory leader is right that piling up debt today imposes unfair costs on the taxpayers of the future. He’s wrong about the degree to which the current level of federal debt is doing this. Ottawa’s debt-to-GDP ratio is by far the lowest of any Group of Seven government and it’s falling. At this rate, the country’s grandchildren will hardly be stooped under the bondholder’s yoke. Although the federal debt burden isn’t large, the federal budget is in deficit. And Canada’s Class of 2050 can feel let down by the reason for the excess of spending over revenues. In 2015, the Liberals sold deficits as a way to update the country’s bridges, roads, broadband and public transit. The plan was to run small deficits to build infrastructure – an investment in the future. Instead, the deficit is being driven by spending on things such as the Canada Child Benefit – which, even if it is a good idea, is current consumption. It’s borrowing to spend in the present, for the present. The commuter of 2038, whose trips to and from work are faster, cheaper, easier and less polluting because Toronto finally built another subway line, doesn’t vote in the 2019 federal election. But the middle-class parent who gets an extra $2,000 cheque does. Here’s another question about intergenerational fairness: Who should benefit from non-renewable resources? Is some of the wealth owed to future generations? In the 1970s, Alberta thought so. It created a savings fund to sock away some of its oil revenues. When Norway became a major oil producer, it did likewise. But after oil prices dropped in the 1980s, Alberta stopped saving. Norway, in contrast, for decades has been investing a big chunk of its oil revenues. The Alberta Heritage Savings Trust Fund is worth $17.6-billion dollars. Norway’s fund is worth about $1.3-trillion. Lucky future Norwegians – thanks to the foresight of past Norwegians. Deferred gratification is hard, especially with elections every four years and people struggling to make ends meet or keep up with the Joneses. But Mr. Scheer is right: “Intergenerational theft” is a real problem, if not exactly the one he imagines. G.K. Chesterton called tradition the “democracy of the dead.” Our democracy needs to pay more heed to the not-yet-born.